AKA Cassius Marcellus Clay, Jr. Someone stole Cassius Clay's bicycle when he was 12, and he groused to a policeman that he'd whup the culprit. The cop told him he'd better learn to fight first. 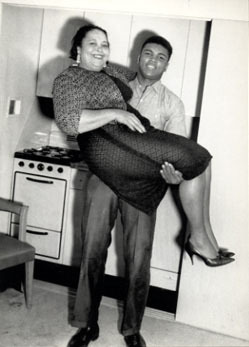 The kid never got his bike back, but he did win six Kentucky Golden Glove titles, two National Golden Gloves, two Amateur Athletic Union championships, a Gold Medal in the light heavyweight division at the 1960 Rome Olympic games, and the world professional heavyweight championship -- three times. As a pro, Clay was 18-0 before meeting the "invincible" heavyweight champ, Sonny Liston. Clay talked tough wherever there was a microphone before the match, promising to whup Liston, and created a hype boxing had never seen before. Then he beat Liston by knock-out, and immediately announced he'd joined the Nation of Islam and dropped his "slave name". His new name was Muhammad Ali, but the media generally continued calling him Cassius Clay (except during interviews). In 1967, America was at war with Vietnam. When Ali got his draft notice, he arrived as instructed for the physical exam, and cooperated politely until it was time to take the Army oath. He refused, saying, "I ain't got no quarrel with them Viet Cong". A month later an all-white jury found him guilty of draft evasion, and Ali was imprisoned. His boxing license was revoked, and he was stripped of his world championship. Almost four years later, the U.S. Supreme Court overturned his conviction, and decided that under the tenets of Islam Ali was a conscientious objector, not a criminal. Ali fought for the heavyweight championship again in 1971, losing to Joe Frazier, but in a 1974 rematch, he knocked out Frazier. He KO'd George Foreman in Zaire to win his second heavyweight championship. In 1978, he lost the title to Leon Spinks, and at 36, it was widely believed that Ali's fighting career was over. Seven months later he KO'd Spinks, and Ali held the title until announcing his retirement in 1979. Even after that, Ali tried one more comeback, but it got ugly fast. Nobody beats the calendar. His bravado made Ali more popular than any boxer before or since, and he has pronounced himself "the greatest fighter of all time". Ali's autobiography, titled The Greatest, was filmed in 1977, with Muhammad Ali playing himself. More recently Will Smith played the role in Ali (2001). Parkinson's disease, probably brought on by taking so many blows to the head, has left Ali virtually unable to talk. He remains beloved worldwide, and still makes many public appearances. For years, Ali said he had angrily thrown his Olympic gold medal into the Ohio river after an encounter with white racists. More recently, he simply says the medal "came up missing". He was given a replacement medal at the 1996 Atlanta games, where he also lit the ceremonial torch.